This past holiday season, you couldn’t lob a meatball across a room without hitting a partisan of the Ketogenic diet. So when CNN announced January 3 it was among the most-searched for diet-related terms in 2018, we weren’t surprised. In fact, we were intrigued as we sometimes receive emails and messages on social media from people who’ve intentionally lost weight while stepping up their grilling game. After doing a bit of research, we discovered many of the recipes we’ve published over the years could help people stick with this popular regimen. Of course, we are neither doctors nor dietitians, and are not here to debate the pros or cons of the program. Always consult with a healthcare professional before adopting a new diet, particularly any diet that is controversial. The Ketogenic Diet Overview: Called the “keto” diet for short, this diet was developed in the 1920s to reduce epileptic seizures in children. According to a recent article in Eating Well magazine, the diet requires that 80 percent of your calories come from fat, 15 to 20 percent from protein, and 5 percent from low-carb vegetables. By “starving” the body of carbohydrates, which the body breaks down into glucose, you force the body to generate energy using fats (the liver turns them into “ketones,” thus the name keto). What Can You Eat? Among the “approved” foods are meat, fish, poultry, butter, olive or avocado oil, cream, eggs, nuts and seeds, and low-carb green vegetables. Below are more than a dozen grilled or smoked recipes that satisfy (with very little modification) the keto diet’s requirements. Spruce-Grilled Steaks: Juicy rib eye steaks seasoned simply with coarse salt and pepper and subtly flavored with sprigs of fresh spruce—perhaps finished with a dab of butter—cook in minutes (a plus in winter weather). As an alternative, throw a sumptuous beef tomahawk steak on the grill and top with blue cheese butter. Cheese-Stuffed Bacon-Wrapped Jalapeno Poppers: No tailgating party or Super Bowl Sunday get together would be complete without poppers. Lately, we’ve been adding chopped barbecued brisket to the filling, but you could substitute grilled chicken, chopped pork shoulder, or even crabmeat. Bacon, Ham, and Cheese Chicken Thighs: These flavorful bundles, which can be assembled ahead of time, utilize one of the fattier parts of the chicken. Use a low-carbohydrate mustard such as Dijon. 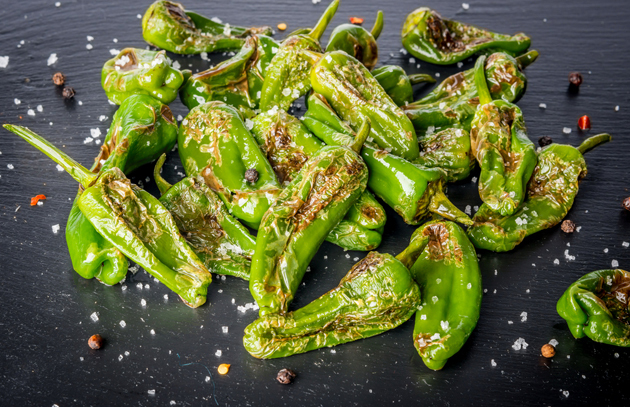 Blistered Shishito or Padron Peppers: No formal recipe here. 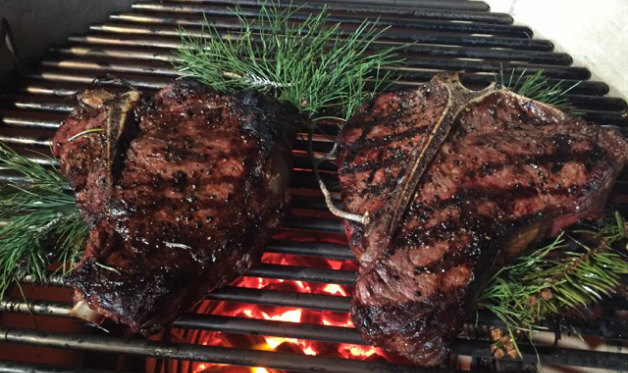 Simply heat a plancha or cast iron skillet on the grill grate or your grill’s side burner. Add a couple of tablespoons of olive oil and 2 cups of shishito or padron peppers. (The two are similar.) Blister, moving around with tongs. Season with coarse salt and fresh pepper before serving as an appetizer or side dish. Barbecued Pork Belly: Eliminate the 2 tablespoons of sugar from the rub to stay within the keto diet guidelines. The pork belly will still be terrific. Brisket on the Bone: Not really brisket, but huge meaty plate ribs that will astound with their deep, beefy flavor. Victor’s Shrimp: One of Steven’s most popular shrimp recipes could be the centerpiece of a Spanish tapas party. Add the padron peppers above to the menu, too, along with manchego cheese, olives, Iberico or Serrano ham, smoke-roasted deviled eggs (make the eggs with sugar-free mayonnaise), or nuts smoked with your favorite sugar-free barbecue rub. Smoked Planked Trout: Fresh whole trout stuffed with lemon and dill gets the plank treatment in a recipe first published in Steven’s voluminous book, BBQ USA. Tandoori Grilled Salmon Steaks: Unsweetened yogurt and fragrant spices transform salmon steaks into an exotic meal. (The egg and chickpea flour are optional ingredients. Simply replace them with more yogurt as indicated in the recipe.) Or, perhaps the salmon and zucchini kebabs pictured above snagged your attention. 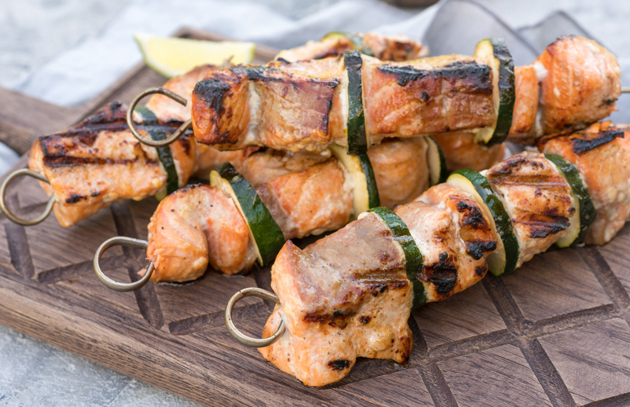 Soak cubes of salmon in your favorite sugar-free marinade or vinaigrette, then thread on skewers with rounds of zucchini. Grill over direct heat until the salmon is cooked to your liking. Thai Grilled Kale: Kale is a nutritional powerhouse, and excellent when crisped on the grill. Finger Burner Lamb Chops: From Steven’s latest book, Project Fire, come these tender lamb chops that are best eaten hot off the grill—thus their name—as an appetizer. Memphis Dry Rub Ribs: Traditional Memphis-style ribs, the kind they’ve been serving for years at the famous Rendezvous, are dusted with a dry rub but served without barbecue sauce, most of which contain sugar. (Hello, Kansas City!) So they’re green-lighted by the keto diet.